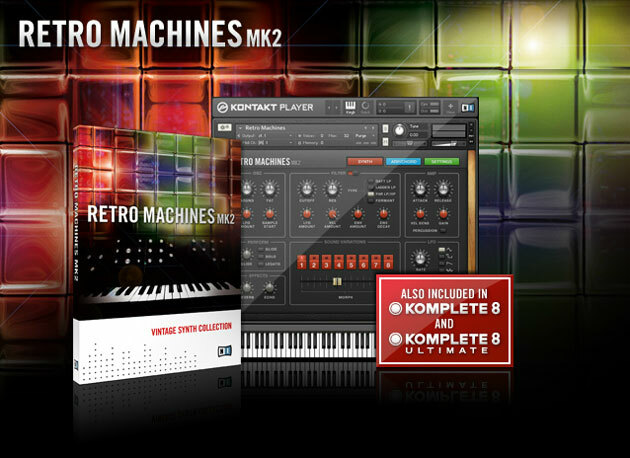 RETRO MACHINES MK2 is a collection of 16 definitive analog synthesizers and keyboards, lovingly sampled and refined for the world's leading sample platform, KONTAKT 5. The collection covers the classic, the idiosyncratic and the exotic instruments that defined electronic pop in the 70s and 80s. Today, the originals are hard-to-find, expensive, and often temperamental. 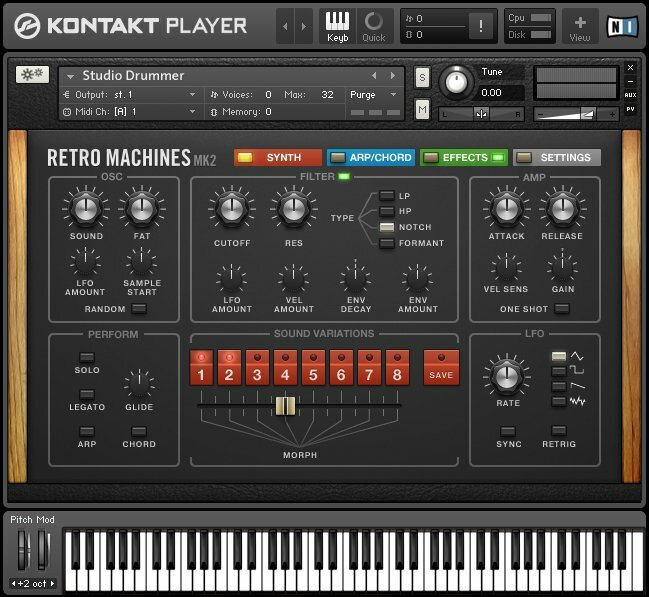 So if you'd rather be making music than worrying about tuning, here's your vintage ticket: RETRO MACHINES MK2 gives you thick, creamy, analog sound without the repairs, and with all the benefits of state-of-the-art software technology. The interface provides consistent control across the board, whichever vintage monster you're currently tweaking. Each preset captures the character sound of the original instruments, with eight integrated sound variations. Each variation is a production-ready synth sound, a specific combination of OSC, Filter, Amp and other settings. Your tweaks are saved within each variation, and you can use the Morph slider to shift between variations for dynamic sound. The arpeggiator in RETRO MACHINES MK2 is a modern re-interpretation of the arpeggiators in the original machines. Choose 16 steps or 12-step triplet mode, and define the velocity of each individual step. What's more, you can assign a different sound variation to each step in the pattern —a smart trick for dynamic, expressive arpeggios. The Chord Player creates chords from single notes, which is especially useful in combination with the arpeggiator. In Fixed Chord mode, set your intervals and play chords with one finger up and down the keyboard. Turn off Fixed Chord, choose a key template, and the chords you hear automatically fit the selected key, for perfect, elegant harmony. The iso is ok, try to download it again.